Two people have heart attacks. Who gets back to work sooner? The one who thinks their illness will be short, even if their symptoms were worse, according to research in the rapidly expanding area of patient illness perception. But the main reason for this, explains new Royal Society of New Zealand Fellow and Mason Durie Medal recipient, Professor Keith Petrie, is not that a positive attitude can cure you. It’s because getting people to stick with treatment is one of the biggest problems facing medicine today. Why do similarly ill people have varying ideas about how they feel? People have in their minds a collection of symptoms that go with a condition – we pick up that information from people that we know who have had the illness and from the media. So if you get an illness, you have a ready-made model that goes with that condition and which then comes into life. With heart attacks, we measured people’s perceptions and looked at who got back to work quickest. People who believed that their illness had a short timeline and fewer consequences got back to work faster. While medical indicators of seriousness of the heart attack were not good predictors of return to work. Causal beliefs about the illness are also important as these point patients to treatment. Generally we like the world to make sense so we look for causes of things. Sometimes the causal beliefs we have might not be compatible with the treatment we’re prescribed by a doctor. For example, a common belief about the cause of a heart attack is stress. If you have that model in your head and the doctor suggests you stop smoking, lose weight and take these pills – those treatments might not be compatible with your ideas about the cause of the illness. If you believe stress is the cause you’re more likely to want to give up work and take things easy rather than take pills or lose weight. So then patients don’t take the pills? Yes. Adherence is probably the biggest problem facing medicine today. Enormous numbers of people across a wide range of conditions either don’t start treatment or don’t continue with it. I suspect this has gotten worse over time. There’s a sort of zeitgeist to try to do things without artificial substances these days and so people are less likely to be accepting of treatment. Generally we are healthier than in the past, but much more concerned about our health. But in a way we’re victims of our own success because there’s a paradox that the healthier we are, the more we worry about our health. And we tend to worry about ridiculously small dangers to our health while downplaying the risk from common risks. Does having a positive attitude towards illness help you get better? If someone completely denies an illness that’s not usually helpful. If there’s nothing you can do about your illness, it probably doesn’t make any difference whether you’re positive or not. But with most illnesses there are things you can do to improve the condition. It’s not really about being positive or negative – that’s really too simplistic. It’s about how the patient sees their illness. If people have strong views on the necessity of treatment they’re more likely to take the treatment. One of the other dimensions that’s quite important for adherence is timeline beliefs. For most people it’s quite hard to conceive of an illness that lasts for the rest of their life like diabetes. And there’s an important symmetry between symptoms and illness. If we don’t have symptoms we don’t see the necessity of taking treatment, even when it is necessary. Asthma is a good example because people’s behaviour is strongly determined by symptoms. They tend to take their preventer inhalers when they have symptoms rather than when they don’t. Similarly with hypertension people end up taking tablets when they feel stressed or ill, and not otherwise. These ideas about illness are very key to people’s behaviour. How do you change people’s perceptions of their illnesses? One of the problems with this area when I first started was that there was no way of measuring people’s perceptions. That’s why we developed the Illness Perception Questionnaire, and the different versions of the scale have now been cited in the research literature over 3,000 times. I think it’s proven that its really valuable as a technique and as a way of looking at patient perceptions. The other thing is that it brings the patients’ views much more prominently into the clinical setting. I think that’s a valuable message. No matter how smart a doctor you are your treatment is not going to work unless the patients take the medicine. We have done a number of studies where we have changed patient’s illness perceptions to improve outcomes. One example is a study we did with asthma patients designed to improve adherence. In this study we sent patients individually tailored text messages based on their illness and medication beliefs designed to nudge their beliefs to be more consistent with adherence behaviour. So, for example, patients who based their behaviour on whether they had symptoms were sent messages such as “Your asthma is always there, even when you don’t have symptoms”. The group that received these targeted text message showed significantly improved adherence compared to a control group. Can perception interventions help people who worry about their health too much? That’s a really understudied area – doctors commonly use reassurance to tell people they don’t have an illness, but often it’s not that successful because it doesn’t actually address people’s concerns. Just saying, “don’t worry everything is fine” doesn’t work. You need to specifically identify what people are concerned about in order to provide effective reassurance. We’ve done work trying to improve reassurance after medical testing. We did this by giving people more information about a test before they have it. Then afterwards, they have a better basis to evaluate what the results mean. We have also looked at the psychological impact of medical test results and how they change people’s intentions to improve their health behaviour – stop smoking or lose weight etc. An interesting aspect of this work has been showing how people often prepare themselves for the worst outcome before major medical investigations. 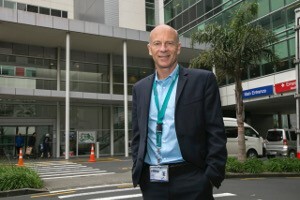 The University of Auckland’s Professor Keith Petrie was recently awarded the Mason Durie Medal for his research into patient’s illness perceptions at the 2015 New Zealand Research Honours gala dinner. Keith Petrie receives the 2015 Mason Durie Medal from Caroline Saunders at the Royal Society of New Zealand Research Honours dinner.